Well Folks the next chapter in the Marvel Universe is out and ready for us to devour. Thor hits all theaters this weekend. FedMex has his review in the bag. It will be interesting the consensus on this one in particular, because it is not the normal hero film. I personally really liked the film and my review will be up shortly. So enjoy this review by FedMex and let us know your thoughts on the Might Thor. So, I’ll be honest, I’ve never once in my life ever read an issue of any comic related to Thor. Yes, I know, blasphemy. I’ll take my licks as they come from you true believers after you read this, but I was still very excited to catch the midnight showing of the film before premier night. The fact that I have no prior knowledge of the character may have affected my feel for the film, but again, bring on your judgment! I can take it! First and foremost, since the reprise of Marvel films beginning with X-men, this was the least believable of the bunch. Why? 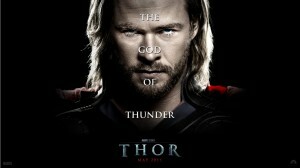 Well, it’s Thor, a god from Asgard. Up until now, we’ve been dealing with mutations, science projects, and the filthy rich. Now, we have a god. Does it make sense? Sure. The land of Asgard is a true place in space that’s been confused for deities. The pyramids were built by aliens. Flying saucers were mischaracterized as angels. Jesus was a hippie. Still, though I spent the first half of the film trying to believe that Asgard exists (and silently laughing at the word “Asgardians”), I quickly actually bought the whole story. Thor, the spoiled god, has to go through stuff to become a real god a.k.a. superhero a.k.a. necessary character for the sure to be amazing Joss Whedon’s Avengers. Now the breakdown. Natalie Portman: did not give the effort to her performance that she did in Black Swan. Actually, she was very “Episode I.” Anthony Hopkins: brought back his character from Beowulf. Tom Hiddleston: Sad Brent Spiner / Data with emotion chip, but he works. Side characters (both human and Asgardians…hehe) : pretty lacking, EXCEPT for one unnamed character right in the middle of the film. I’ll give you a hint…he doesn’t pick up the sniper rifle!!! Chris Hemsworth though, I’ve never seen this guy before. He start obnoxious, but you know, that’s the point. He loves his character. This guy wants you to love Thor, and even though I didn’t totally love the film, I definitely like what he did here. I don’t want to give much away, I didn’t know much of why the main enemies were who they were, the backstory was quickly dropped on me and I just took it and accepted it. By about 45 minutes into the film, I was really enjoying it, and that goes on through the end. Once I realized that this is not at all like the other Marvel movies were we are actually meant to believe that this is all possible, and that this is about a character that lives so far out of our actual reality that we have to travel alongside Asgardians (hahahaha) to get the movie, then I could sit back, relax, and enjoy the ride. I’m sure all of you will too. Also, least I forget, notable appearance by Gort from “The Day the Earth Stood Still.” This robot comes back from the 50’s and now can breathe fire!!! To quote Bruce Willis, Klaatu Barada Nikto mother*****. GET ALL OF YOUR THOR COMICS HERE!!! This entry was posted on Saturday, May 7th, 2011 at 1:27 am	and is filed under Comics, Film, News. You can follow any responses to this entry through the RSS 2.0 feed. You can skip to the end and leave a response. Pinging is currently not allowed. « Come To The “Viva La Revolucion” Burlesque Event At The Lakewood Theatre Tonight!! !